The Farm to Cafeteria Program celebrated its first harvest on June 28th! The initiative is a partnership between the Marin County Health and Human Services’ Healthy Eating Active Living Initiative (HEAL), Sanzuma, San Rafael City Schools, and the Marin Food Policy Council. 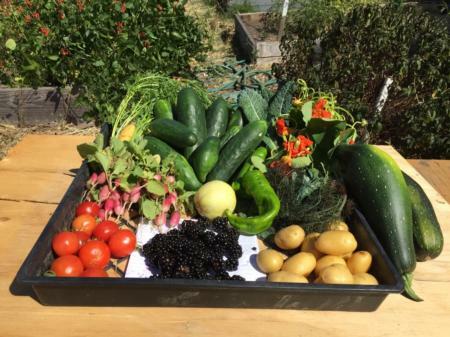 Staff from Sanzuma led the project and harvested produce from San Pedro and Bahia Vista Elementary school gardens. 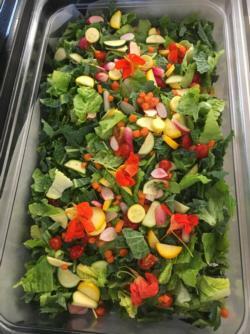 An array of vegetables and fruit were sold to the San Rafael City Schools’ food service program including blue kale, mixed greens, breakfast radishes, cherry tomatoes, lemon cucumbers, two colors of zucchini, and nasturtium. The fresh produce was served the next day at Bahia Vista’s summer lunch program where the children are participating in the nutrition education classes. Proceeds from the harvest go to sustain the garden at each school. The Farm to Cafeteria Program was designed to provide fresh organic produce for school meals, increase fruit and vegetable consumption among students, and support community food production. Programs like this are critical to improving children’s health. The project hopes to scale up and expand to include produce from local farmers in the next school year. Stay tuned for more information!